�KITCHEN GOURMET� � Simple Mills Offers Nutritious Foods for a Greater Life! Simple Mills enriches lives and bodies through simple, delicious, real foods. They strive to make healthful choices easy by offering food that tastes great in the moment and nourishes your body for the long-term. Simple Mills Baking Mix products include Pancake & Waffle, Banana Muffin, Pumpkin Muffin, Chocolate Muffin, Pizza Dough, Artisan Bread, Chocolate Chip Cookie, and Vanilla Cake. Their Almond Flour & Sprouted Seed Based Cracker varieties include Fine Ground Sea Salt, Rosemary & Sea Salt, Sundried Tomato & Basil, and Farmhouse Cheddar. For convenience, Simple Mills� cracker now come in a Snack Pack. Also, Their new Organic Frosting varieties include Chocolate and Vanilla. Simple Mills� Fine Ground Sea Salt Almond Flour Crackers are the ultimate snack. Grab a handful and fuel up for your next big adventure! They are made with a wholesome blend of almond flour, sunflower seeds and flax seeds, and offer a good amount of protein per serving, as well as providing a good source of Vitamin E.
Cookie craving? Simple Mills has got you covered! Indulge in snack time, and feel good about it, with Simple Mills� Crunchy Chocolate Chip Cookies. Also, new from Simple Mills are a variety of Soft Baked Cookies, including Snickerdoodle, Chocolate Chip, Peanut Butter, and Dark Chocolate Toasted Coconut. There�s nothing like naturally gluten-free muffins. 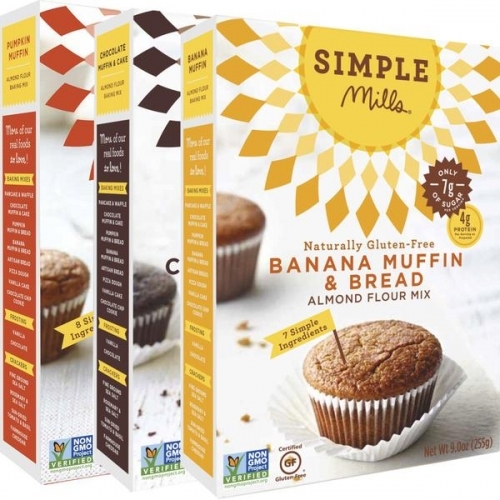 Simple Mills offers a variety of tantalizing almond flour muffin mix flavors, including Chocolate Muffin & Cake, Pumpkin, and Banana Muffin & Bread. At Simple Mills, they believe if you don�t recognize an ingredient, your body won�t either. Therefore, Simple Mills handpicks their ingredients with purpose - only including things that nourish you. In other words, there is nothing artificial, ever, so as to positively impact the way food is made, because they believe good health enables greater, passion-filled lives. Simple Mills offers clean, nutritious foods, for a greater life. It�s that simple. For more information on Simple Mills please visit www.simplemills.com.